Barbara has exhibited her art Heaven Hi Originals and has a permanent display (in association with Minnesota Women Artists) at Health Partners Women’s Clinic in St. Paul. In 2008, Barbara was a Wall Dog participant in painting murals along Nicollet Ave in South Minneapolis. In 2012, Barbara collaborated with 25 other artists to create murals at Martin Luther King, Jr. Park in South Minneapolis. 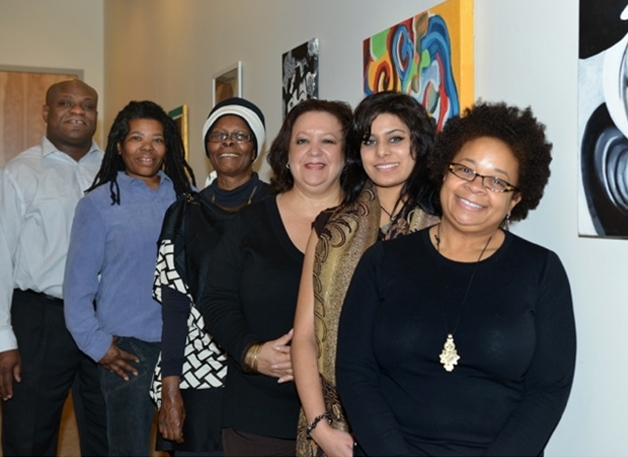 Also in 2012, Barbara displayed her art at the Hennepin Gallery located in the Government Center as well as a group exhibition at Sean Garrison’s Studio “Fade to Blaq” show. Currently, Barbara has an ongoing display of art at Emerge Community Center and UROC. Barbara is a member of TAWU/ROHO Collective. My inspiration to create art comes from my father, now deceased, Mr. Lewis Walls. I started at an early age at the kitchen table in the mornings while my father sipped his coffee…there were always a pencil and scraps of paper there as this doubled his work desk for his business as a small package courier. He always said “Draw what you see Barbara Ann”. He would even draw little pictures and tell me to just copy those. This seemed to delight him and would bring many happy conversations and bonding between us for many years. My other inspiration came from a grade school teacher, Ms. Doll, at Clinton School, who noticed I love to draw and paint and would encourage my interest and chose me to participate in art projects in the classroom.